BYOD vs. Corporate Owned: Which Is Better for Small Business? No matter how small, businesses today must be fully mobile-enabled. That means not only making it easy for customers to do business with you via mobile devices, but enabling employees for mobility as well. Business apps, for example, have become critical to keeping on-the-move employees productive. According to InfoStreet, the average small business today relies on five to 15 apps daily. Mobile apps, of course, require mobile devices. Many small businesses face a critical decision: Should they allow employees to use their own smartphones for work purposes (commonly referred to as Bring Your Own Device, or BYOD) or furnish corporate-owned devices to them? The choice involves balancing the challenges around productivity, security and cost. Allowing employees to use their own mobile phone for work might seem the simpler solution — after all, 77 percent of Americans own a smartphone and keep it with them at all times. But there are several downsides to BYOD when it comes to security, productivity and operational efficiency. Mobile security is the most urgent concern for many businesses, particularly when it comes to sensitive corporate data. If employees own their devices, it’s much more difficult to ensure data remains protected. Will your employees download the current versions of security patches? Will they protect their devices appropriately with passwords or biometric authentication? In a BYOD environment, businesses depend on employees to make the right choices for the company’s security. At the same time, there is the issue of business continuity. As your employees become increasingly dependent on mobile connectivity and apps, what happens when their personal phone breaks? A broken phone doesn’t do anybody any good, and it may take that employee longer to get their device fixed than it would to swap out a company-owned device. With corporate-liable phones, companies can implement processes to ensure that configurations, security and repair procedures are standardized. Businesses can also ensure employees always have the latest versions of apps and security patches by pushing updates through an enterprise mobility management (EMM) system. To achieve security standards and to manage corporate use of mobile applications, businesses must deploy a mobile device management (MDM) platform. If the company is providing the phones, they can install the MDM client and make it clear they are managing the devices and apps. A BYOD device policy comes with different rules and expectations because the devices are the property of the employees. Businesses can ask employees to install an MDM client on their phone, but employees may be resistant to company monitoring and having limitations set on their use of a personal device. It’s certainly possible to manage devices and applications in the BYOD model, but as you might expect, it requires more stringent rules and greater oversight. The company’s BYOD policy should clearly explain the requirements for personally owned devices, which applications are whitelisted or blocklisted, and how the company will use EMM to manage the devices. Some companies will choose to offer a mobile stipend as a compromise. Since employees are receiving some compensation, they will be more accepting of the device being managed, and businesses are wise to evaluate their device policy in this light. The cost of the stipend and the added burdens and risks that come with BYOD might tip the scale in favor of issuing company-owned devices. With corporate-liable devices, companies gain greater control over data, apps and how the devices can be used. With these corporate controls implemented, companies can also ensure that security protocols and patches are always up to date. You might think you’d come out ahead on cost with BYOD, but that’s not always the case. According to research from Oxford Economics, while the upfront costs may favor the BYOD approach, other hidden costs make it a less obvious choice. For example, those monthly stipends cost an average $36 per month per employee. In addition, businesses often can take advantage of negotiated discount rates and service plans with carriers and volume discounts with device providers. Businesses should take all of these factors into consideration when calculating costs. In general, businesses with headcounts as low as 10 can expect to save money buying the phones themselves. When choosing between BYOD and the corporate liable model, it pays to consider your options carefully. 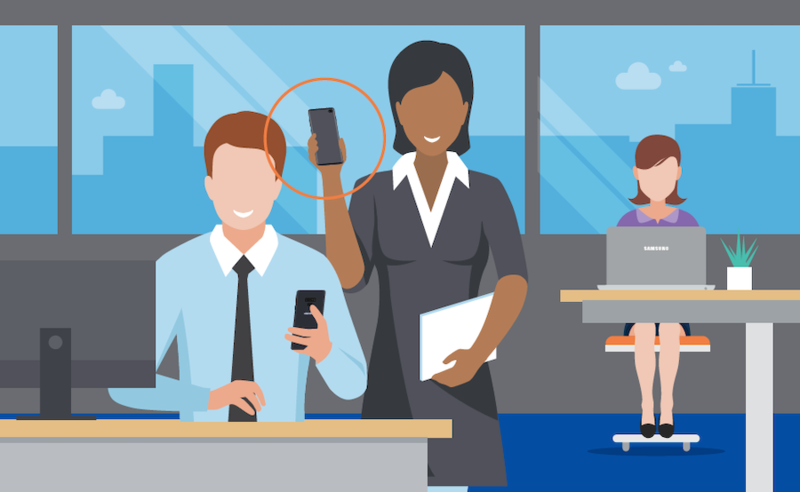 Think about how your employees use smartphones today and how your business is likely to further embrace mobility over time. Weigh the pros and cons, not only for economic reasons, but for security, productivity and manageability. Taking these steps, a clearer path forward will begin to emerge. Small businesses can get discounts and special offers on mobile devices by buying direct from Samsung.